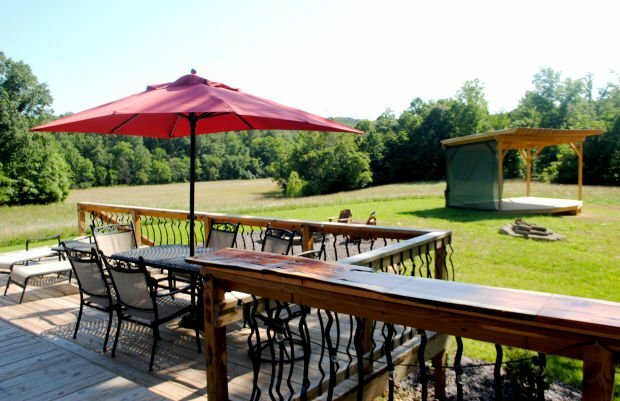 The deck at Firefly Valley in Makanda offers guests a place to sit and relax while taking in the region's natural beauty. It also offers a great view of the venue's new concert stage, where monthly events will be held throughout the fall. The four-bedroom lodge at Firefly Valley in Makanda opened in November. The site offers a beautiful view of the surrounding Shawnee National Forest and a chance to see and hear all kinds of Southern Illinois wildlife. 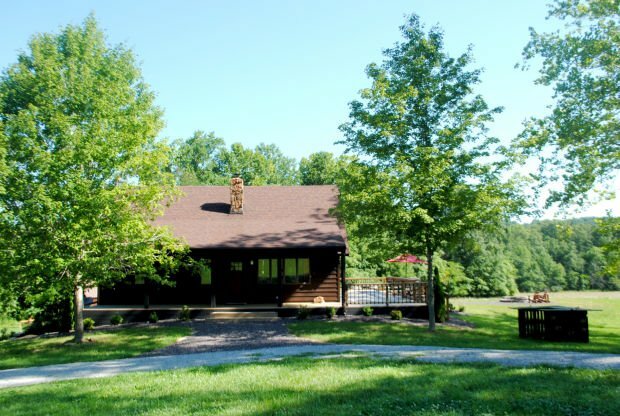 The owners have recently added a concert stage and plan to add cabins to their 75-acre property in the future. Two events have been hosted on Firefly Valley's new stage since it opened earlier this summer, and several more are on tap in the coming months. From concerts to weddings, the venue is becoming an event destination in the heart of the Shawnee National Forest. MAKANDA — Matt and Corene Mavigliano thought the 75 acres of land bordering the Shawnee National Forest in rural Union County would make the perfect spot for a vacation home. And, they thought, when they weren’t staying there maybe they could rent it out to tourists visiting the Shawnee Hills Wine Trail. Too bad for the Carterville couple, almost a year after they purchased the property, they have yet to enjoy the breathtaking views from their fully renovated lodge. First, the couple renovated an old house that sat on the property and made infrastructure improvements. “The house hadn’t been lived in for a long time so we completely redid the inside from top to bottom. We also worked on the exterior and added an enormous deck,” he said. The four-bedroom lodge has an open concept and was renovated with the latest in fixtures and appliances, Corene Mavigliano said. They named their new venture, Firefly Valley, after witnessing fireflies flitting in the valley that leads down to Lick Creek, Matt Mavigliano said. “This is such an amazing place. There is such peace and quiet. When you go out on the deck and look down in the valley, it’s special. You can watch deer and wildlife roaming just 20 acres away,” he said. In fact, the couple recently added an event and concert venue to help bring people to the trail. Several weddings have been booked and a summer concert series added. Monthly concerts are booked through October. Admission to the concerts is free, and beer, wine and food vendors will be onsite. “Our goal is to bring in acts new to the area and great local acts as well,” he said. The future is filled with potential, he said.